About to meet with a VIP client? Is the hot weather getting intolerable? Whether you need to get rid of bad breath in a heartbeat or cool down quickly, iGen can do the trick. These mints cater to those who need a breath freshener while on the go. Here's presenting to you the newest range of mints in Singapore! Double Mint and Sour Strawberry! Each tin is 15g and has 75 mints in it. Pop an iGen and enjoy the cooling sensation in your mouth! 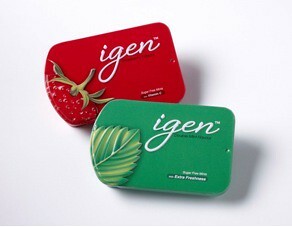 As they are sugar free and delicious, you can enjoy iGen anytime you want. Now conveniently packaged in ‘click-clack’ tins —boasting a unique metal, slide-to-open design— you can bring your mints anywhere you go! Feel refreshed 24/7! SPECIALLY FOR MY READERS, I've got them for giveaways!